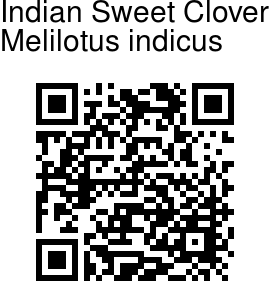 Indian Sweet Clover is an annual herb with hairless stem, spreading or erect, 10-60 cm. 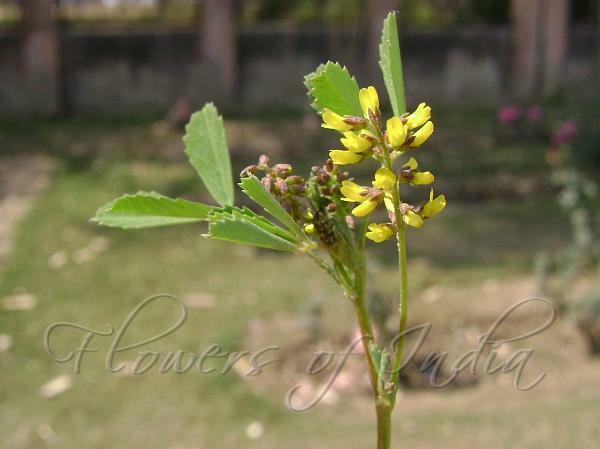 The flowers and leaves have a mild perfume scented fragrance, hence the common name. Leaves are trifoliate, leaflets 1-2.5 cm, inverted lance-shaped to wedge-shaped-obovate, generally sharply toothed on the broader part. Yellow flowers appear in slender, compact racemes that are 1-2 inches in length. Flowers have a 1-1.5 mm long sepal cup, and are 2.5-3 mm long, yellow in color. Nine filaments are fused, 1 free. Flowering: January-March. Medicinal uses: Seeds are made into a soup and used in the treatment of bowel complaints and infantile diarrhoea. The plant is used externally as a poultice or plaster on swellings. The plant contains coumarin, which is an anticoagulant. Identification credit: Amit Kotia Photographed in Delhi.